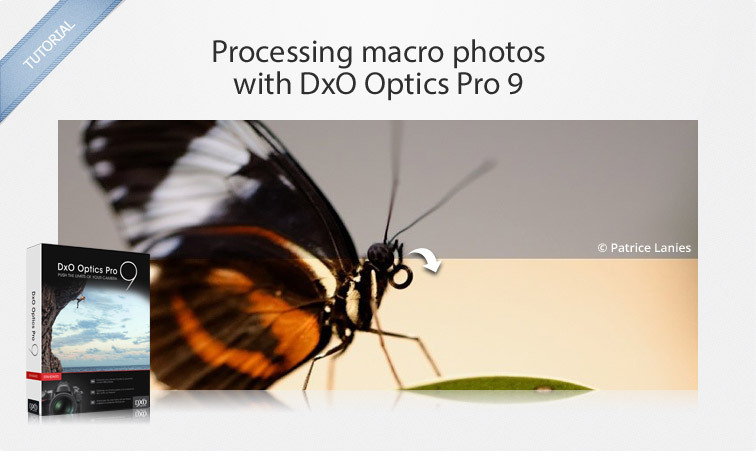 In this tutorial, we will give you some advice about taking macro photos, and then we will explain how to use DxO Optics Pro 9 to correct the exposure, enhance the colors, and reinforce the sharpness of your images. The basic principle of shooting macro photos is to get close to a small subject so that the resulting image significantly enlarges that subject. Being able to do so will largely depend upon your lens, of course, given that not all lenses are capable of shooting closeups. 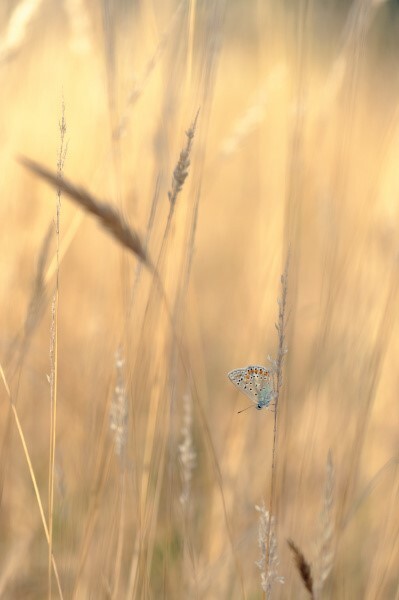 To get close to your subjects, insects in particular, it is better to use a (small) telephoto lens. If your equipment doesn’t allow you to get very close (i.e., requires a too-large minimal distance for focusing), you can try using such accessories as extension rings or hoods. One of the consequences of this combination of telephoto lens and short focal distance is that you will have a very short depth of field. Avoid opening the lens to its maximum as much as possible, and be sure to take this fact into account when shooting! This said, you may have to increase the sensitivity, particularly if you shoot at the beginning of the day, before the insects awaken and the light becomes too harsh. The other challenge for this kind of shot concerns the focus: the subjects can move, and at a such a close position, even the slightest breeze or movement will make the shot difficult; we advise you therefore to set you camera to “continuous AF” mode, or to focus manually. One last piece of advice concerns the composition of your image: while the usual principles apply, don’t forget that you can easily shoot a photo showing the ambiance without having to zoom in very far, and still end up with a very pretty rendering! Open your image in DxO Optics Pro and apply the DxO Standard preset (this will be automatically applied by default if you have not modified the default preset parameter in the Preferences). The basic corrections, adapted to your photo, are automatically applied: correction of optical flaws associated with the camera / lens combination used, and exposure correction following the automatc analysis of your image. To see if you need to apply a global correction, look at the histogram. In particular, do not hesitate to manually adjust the settings to address the dark or burnt areas that you think require further correction. In the case of our image, there is nothing extreme, but the majority of the histogram is on the left, which corresponds to a photo that is a bit dark. It is possible to brighten the image by using the Exposure compensation palette. In this case, since we don’t have a problem with highlights, we will keep the default Smart setting, and simply adjust the intensity slider by moving it to the right to boost the brightness. Set the slider to around +1.20. 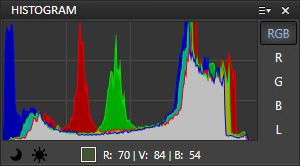 You will see that the photo is much brighter and that the histogram is centered. You can use the Selective tone tool to finely adjust the exposure of your image; as its name indicates, it lets you act specifically on each tonal range in the image that corresponds to one of the four vertical areas in the histogram. If the histogram for your image is relatively close to the left edge, then you can adjust the tonal range corresponding to the right, that is, the Highlights. Set the slider to +40. After adjusting the extreme tonal ranges and the exposure, finalize these settings by working on the intermediate tonal ranges, Midtones and Shadows. 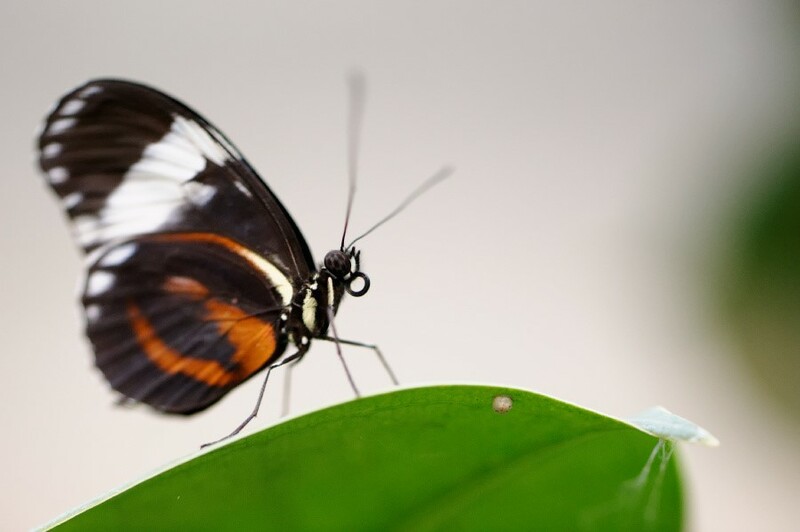 In our example, it is the Shadows that are of particular interest: the fact of having boosted the global exposure has grayed out the butterfly’s wings a bit. We will darken them so as to restore more overall contrast. Set the corresponding slider to –35. In addition to its more traditional corrective use, the White Balance tool can be used to give a particular rendering to the colors in your images. In our example, the color tones are fairly cool, but you can warm them up by boosting the temperature with the Color temperature slider. 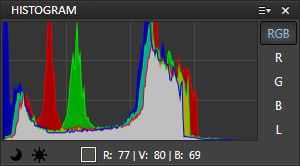 Set the temperature to around 8000 K.
After the color tones are defined, you can adjust each one channel by channel using the Hue – Saturation Luminance (HSL) tool. This tool lets you independently adjust the hue, saturation, and the luminance for each of 6 channels. Of course, most colors are mixtures, so you will need to be careful when using this tool, given that the sliders change the rendering quickly, particularly with regard to hue. It is possible to use the Saturation and/or Vibrancy sliders to strengthen the colors across the whole image; in our example, however, the colored area on the right needs to remain neutral and should not be brought out, so we advise you not to use these tools in cases like this. In the example photo for this tutorial, we are going to adjust the orange color of the butterfly so as to give it more intensity and luminosity. Orange is a color that can be modified both in the yellow channel as well as in the red channel. We will start with the second channel, since there is very little red in the rest of the image (meaning that most of the image will be relatively unaffected by our modifications). So choose the Reds channel in the palette’s drop-down menu. Let’s start by setting the Hue: to reinforce the orange side, set the slider to +6°, which places the slider within the orange tones of the hue; if you move the slider more, it will move into the yellows, brightening the yellow areas in the photo, and making the overall image paler. Next, set the Saturation slider to +30. button next to the name of the palette. We will next use the Yellows channel both to strengthen the butterfly’s orange patches a bit more, as well as to tamp down the yellow dominant generated by the white balance setting. Select the Yellows channel in the drop-down menu. As with the Reds, start with Hue and set the slider to –5°; there, too, you will need to progressively change the values, especially when working on a color dominant in the image. So set the Saturation to –20. So far, we have done what we have set out to do — i.e., achieve a warmer image of a more vividly-colored butterfly. DxO Optics Pro offers several tools to deal with sharpness, starting with the optical corrections which very effectively correct lens flaws (depending on the camera used). Still, you may want to reinforce the automatic corrections, and in this section we will explain the various tools that will help you do so. Note that if your photo isn’t perfectly sharp, certain settings may have the opposite effect and will reinforce the impression of blurriness by accentuating the areas that are already sharp! With macro photos, we advise you not to make the settings too strong; in fact, the proper rendering of this type of photo requires a soft background (or bokeh), and a too-strong application of certain settings will take away this softness from the image. You absolutely must begin with this step, given that other settings can accentuate the noise and thus make it harder to eliminate. The “DxO Standard” preset that is applied when you start processing includes an automatic correction of the noise in your image. It is sometimes necessary, however, to manually adjust this correction by using the Noise reduction palette. In this case, start by using the loupe tool to help you use the Luminance slider. 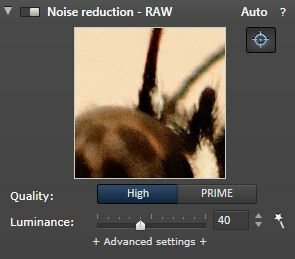 If you see that the default noise setting hasn’t sufficiently removed the noise in your photo, select the PRIME denoising tool. Note that in that case, you will see a preview of the correction in the loupe window, but you will not get to see the effect of the correction on the entire image until after you have exported it. button to deactivate the function. In our example, the rightmost part of the image contains some noise due to the strong exposure correction applied to the dark areas. To correct this, set the Luminance slider to +70. The Microcontrast tool, found in the Contrast palette, will help strengthen the sharpness, but can also be destructive if you make it too strong, so be careful with this setting! In our example, we will need to pay particular attention to the area on the right, which contains some noise, so set the slider to 40. The Unsharp Mask palette is generally not useful if a DxO Optics Module is available, because the module automatically applies the optimal corrections; nevertheless, you can decide to go further by manually adjusting the correction settings. Intensity : controls how strongly the correction will be applied. Radius : sets the thickness of the contours before correction. Threshold : indicates the minimum level under which the correction will not be applied. Edge offset : reinforces the correction on the edges for a more uniform application of the correction across the entirety of the image. We will use the Threshold slider in our example to limit the application to the parts where there is a bit of noise.